The World Series of Poker will be streamed live on Twitch. The coverage includes 31 tournaments and 25 final tables from the prestigious poker tournament series. World Series of Poker's live streams begin on June 2 at 5pm CT and continue until July 14. 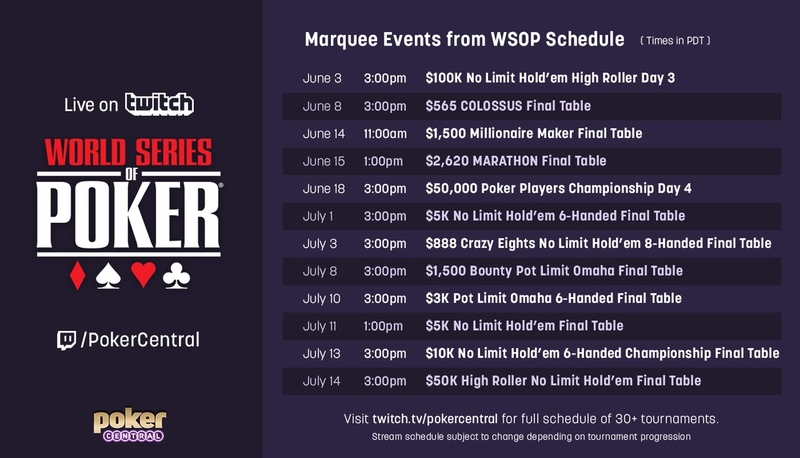 Fans can watch the tournaments at the Poker Central Twitch channel. The tournaments are being streamed in collaboration with Poker Central, a popular poker website and community. David Tuchman and Jeff Plat will provide commentary on the games. Twitch poker personalities will also rotate in and out of the action to provide color commentary and answer questions from the Twitch chat. "Year after year, our goal is to provide the highest quality poker content to as large an audience as possible," Poker Central vice president of content Sam Simmons said in a statement. "To that end, we're proud to work with our long-time partners at Twitch to produce and distribute additional coverage of the WSOP—the preeminent tournament series in all of poker." The World Series of Poker is the longest-running and largest poker event worldwide. Nearly three billion dollars have been awarded in prize money. But the ultimate prize? A gold bracelet, which is awarded to the winners of each individual event. "The Twitch community thrives on interaction with the best players and witnessing the best plays in poker," Twitch poker head Farhan Ahmed said in a statement. "Since poker has continued to grow significantly as a content category on Twitch and the World Series of Poker represents one of the top levels of competition the sport has to offer, it's exciting to bring it to our passionate poker fanbase." The World Series of Poker will feature more than just poker. The major tournament will also showcase Fortnite: Battle Royale, Hearthstone, and FIFA. Video game tournaments will run at the UMG Esports Stage in the main tournament room at the Rio Convention Center in Las Vegas, starting on May 29.